Sam listened to me all the way and showed me exactly how Job Tracker Pro would enable me to move from my excel based business to a near fully automated system. Just wish I'd done it years ago. The support we've had from SB Systems has been fantastic. We've used Job Tracker for a couple of years now but just recently started having problems. Turned out to be a failing hard drive that out proper support people missed. SB Systems stuck with it and tracked the problem down. Many many thanks. We've all been there. Mrs Smith calls up and says "You were out 6 months ago to repair my boiler but it's stopped working again" and she's expecting you to fix it under your warranty. No matter how hard you look you can't find the paperwork so you end up either doing the work at no cost or once you get on site, she shows you her receipt and you tell her its going to cost as it was 2 years ago. She then says not to bother and you're out of pocket having spent an hour just getting there. Job Tracker Professional removes this problem once and for all by giving you quick and easy access to the full site history at the press of a button. 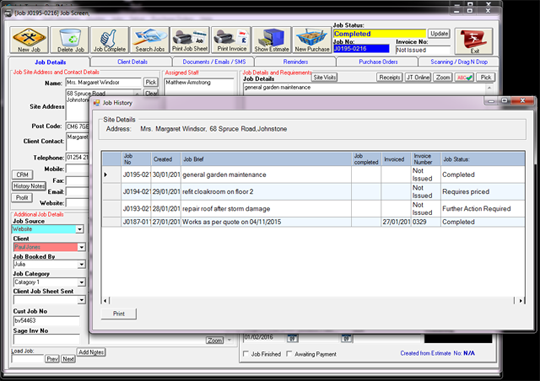 Each time you create a job sheet for a site; Job Tracker Professional will automatically make a note of it and pop it into the history for that site. At the press of a button you can have a look at the entire sites history and very quickly ascertain when previous work was carried out. The site history is also interactive. If you want to drill down and have a look at the full job details simply double click on it and it will open that job.